I like to call the infrared camera the WOW! of the energy audit. It is cool and impressive to see the house through the lens of this high tech device. It can reveal defects undetectable by visual means, but it is not the most important information of an energy audit. The essential information in the audit report is to do with costs associated with upgrading inefficient systems and upgrading building products such as insulation. The table at right is from an actual audit. 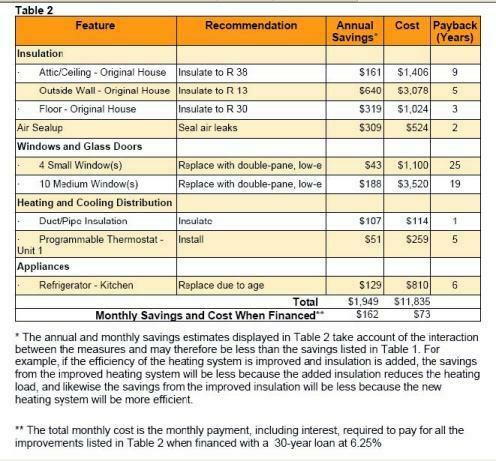 As you can see it addresses the costs of improving the energy deficiencies in the home and the savings realized, by item, for each improvement. 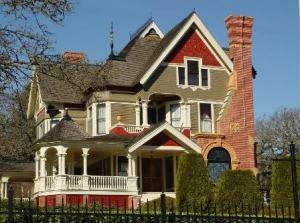 The estimates are based on utility cost in the homeowners’ area and current loan rates. This affords a fairly accurate financial analysis for the client. With this information they can choose the most cost effective improvements with the best returns. So how does infrared fit into this service? The IR camera can reveal areas in the home where insulation is missing or pin point air leaks that make the home uncomfortable. It can even reveal hidden manufacturing defects in windows. It is an essential tool in performing a complete energy analysis of the home. But scanning a home with an infrared camera is not an energy audit. As is clear it provides none of the important cost information the customer needs to smartly improve the energy efficiency of their home. As energy costs continue to climb people will be seeking professionals who can direct them in lowering their utility bills. Don’t be WOWED! into hiring a company that provides impressive pictures with no substance. The money spent on an energy audit should be the first payment in your energy improvement investments.